Join the Studio Art Department for Breakfast with the Arts with Sculptor and Visiting Lecturer Joseph Montroy. Pastries and coffee from Lou's Bakery will be served! Joseph Montroy is a sculptor working in cast and fabricated metal. 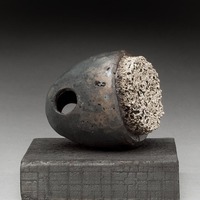 His sculpture explores concepts of intimacy and communication, myth, and the symbolic aspects of form. He has shown work at The Grounds For Sculpture in Hamilton, New Jersey; Franconia Sculpture Park in Franconia, Minnesota; Sloss Furnaces in Birmingham, Alabama; New England Sculptors Association in Bridgewater, Massachusetts; Society of sculptors Annual in Pittsburg, Pennsylvania, as well as at many galleries around New England. Joe has been commissioned to create public sculptures and the Askins Award for the International Trade Preservations Network in Frederick, Maryland. He has been teaching sculpture, drawing, and demonstrating the cast iron process and bronze sculpture casting since 2006. Joseph Montroy holds an MFA from Rochester Institute of Technology in Rochester, New York. He is currently teaching Sculpture I class as Visiting Lecturer at the Department of Studio Art for winter term’19. This event is sponsored by the Leslie Center for the Humanities.